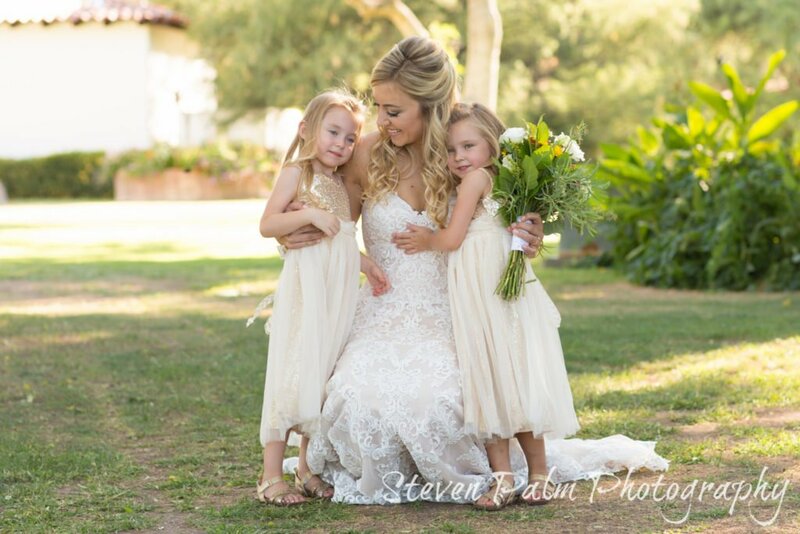 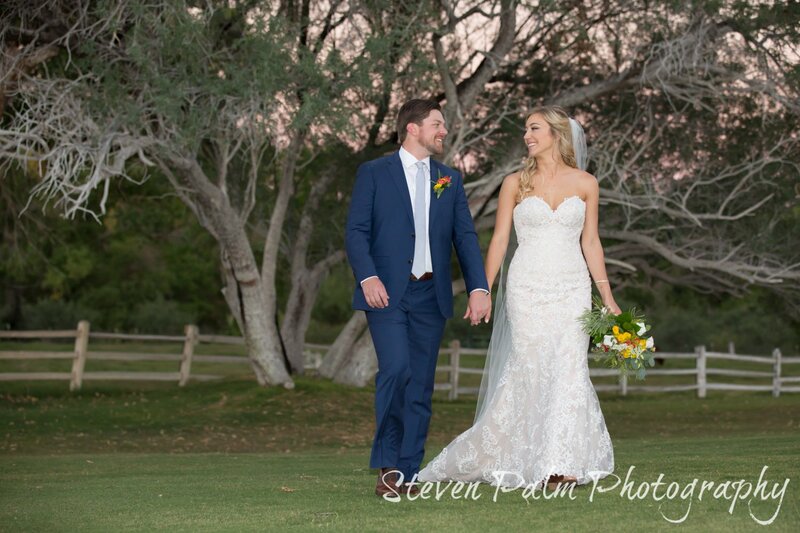 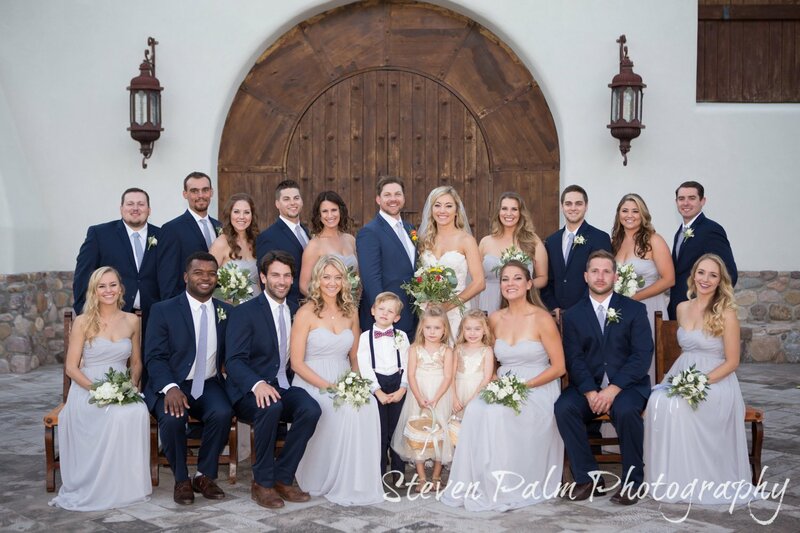 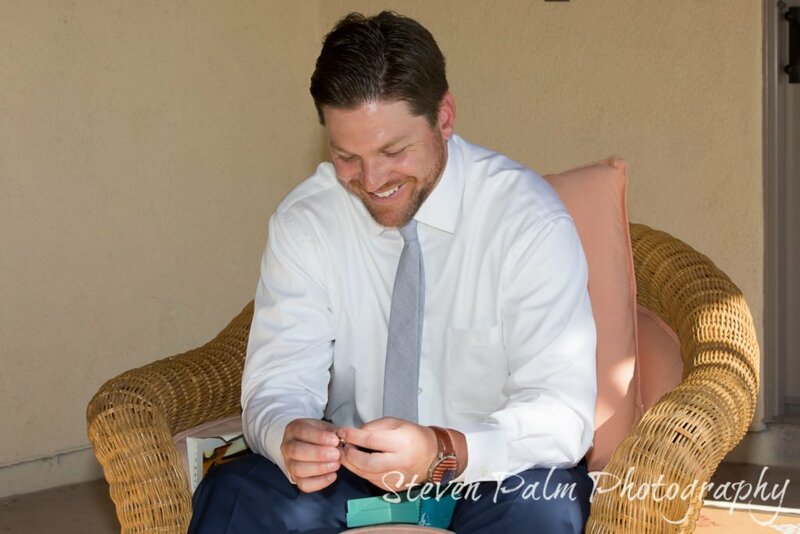 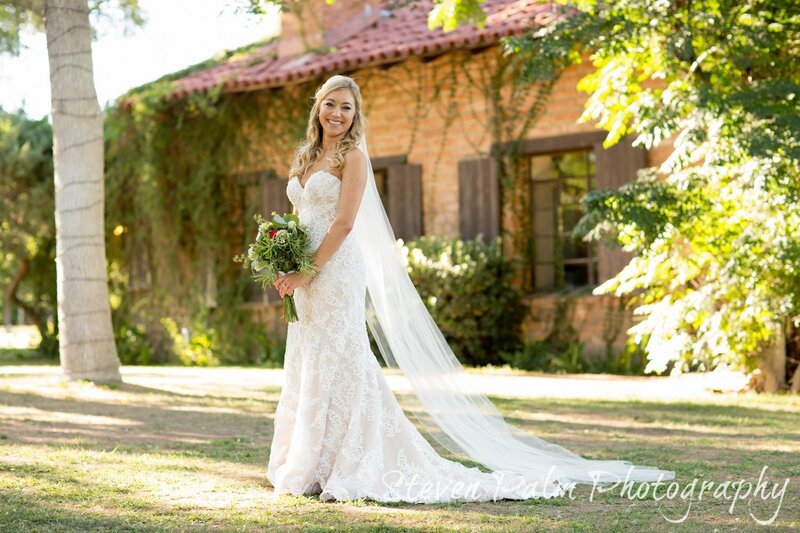 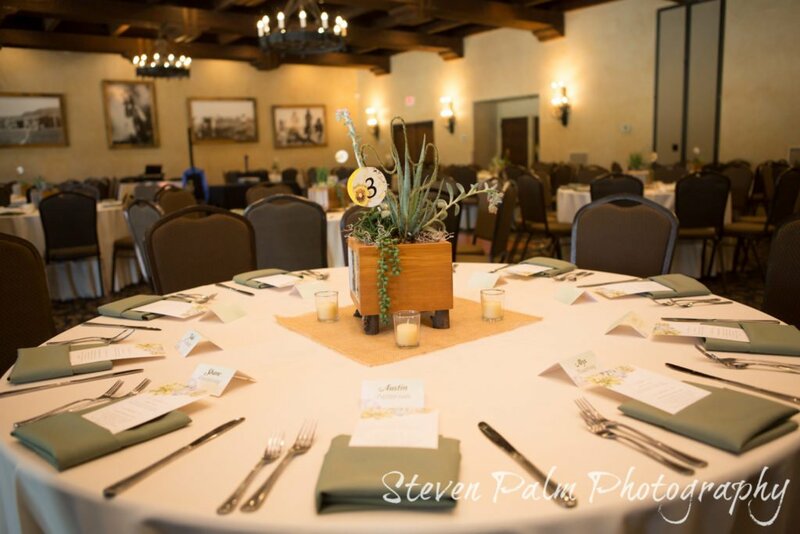 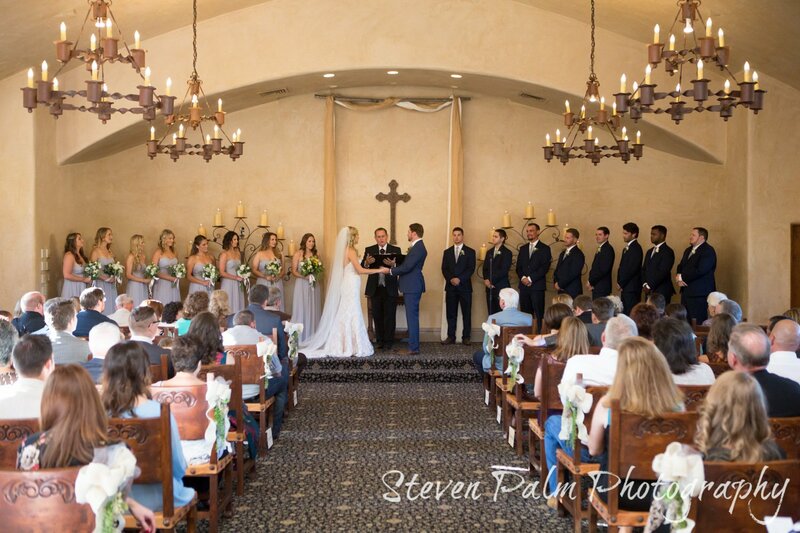 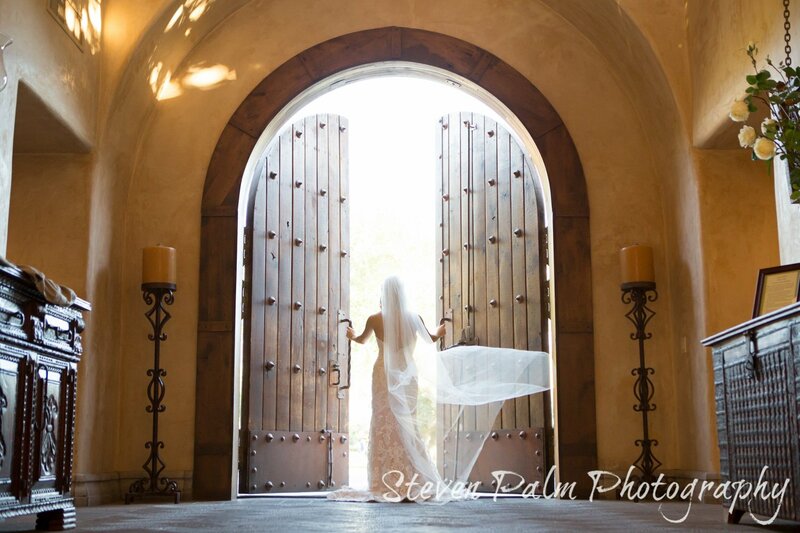 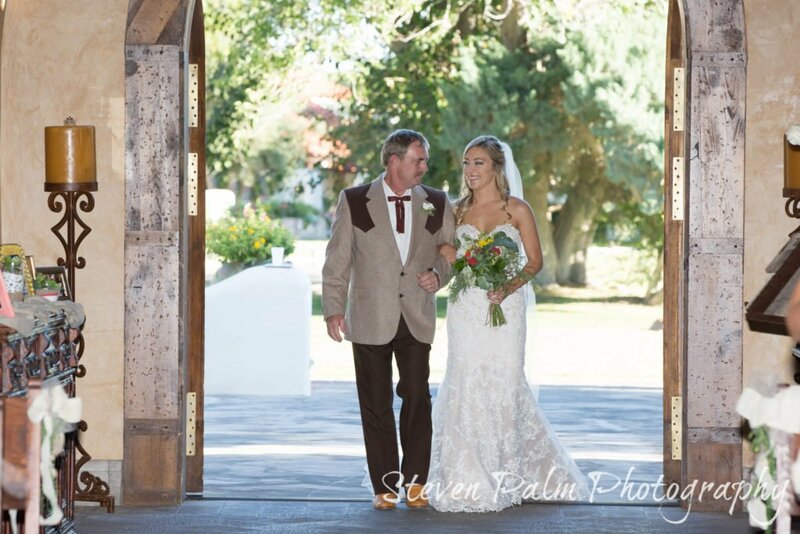 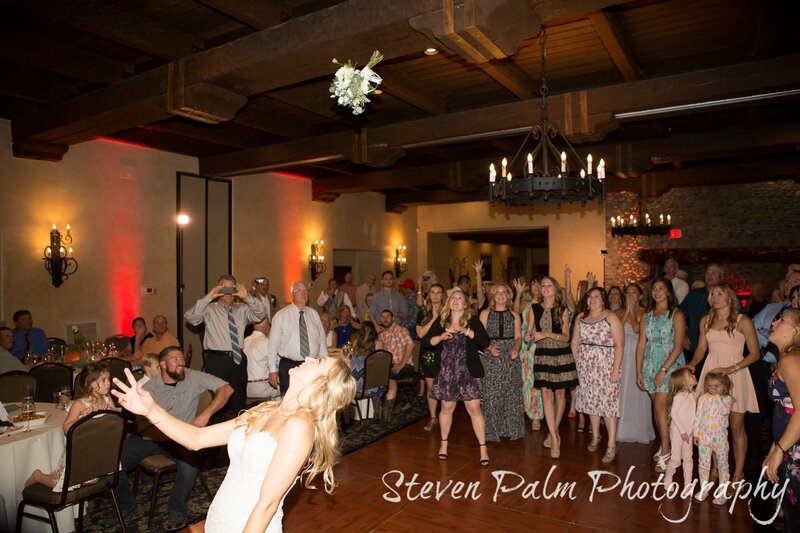 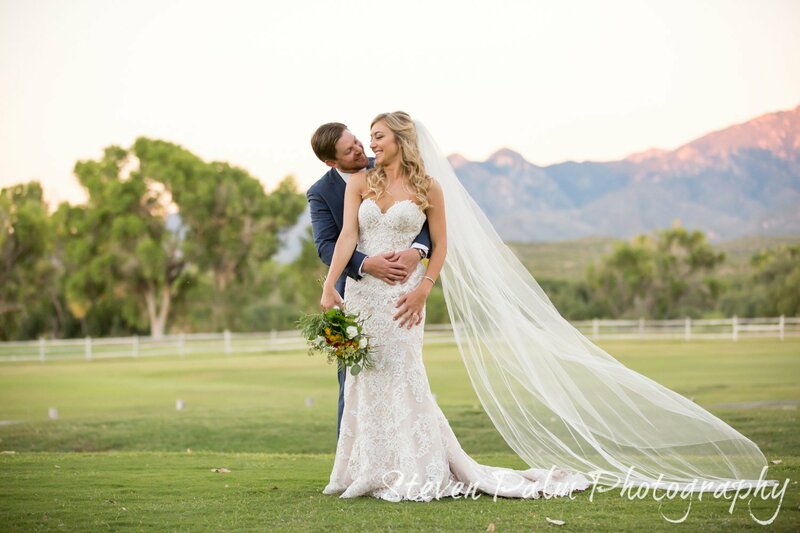 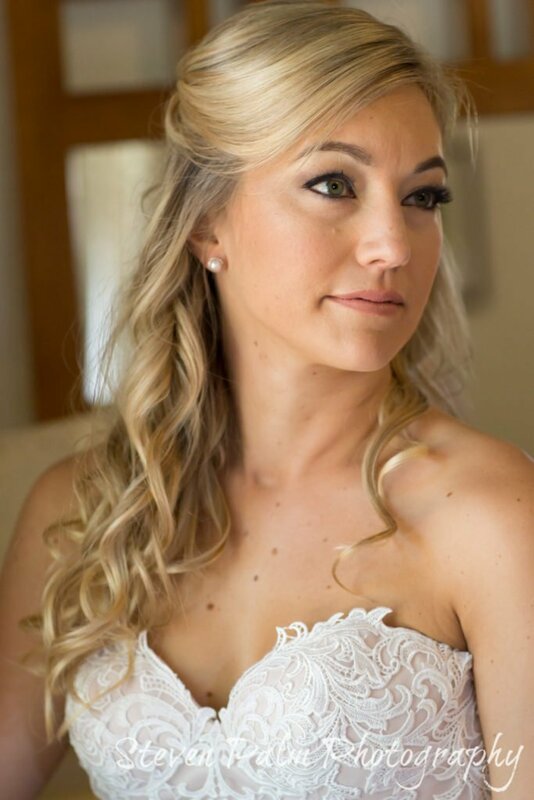 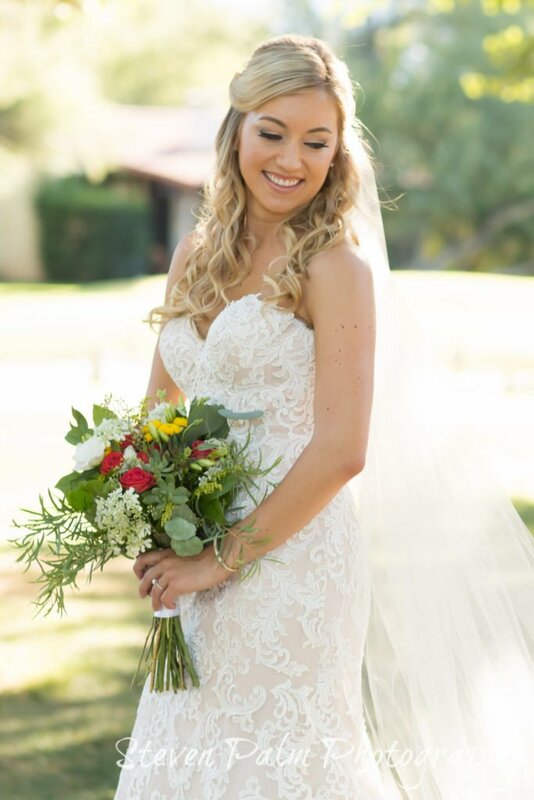 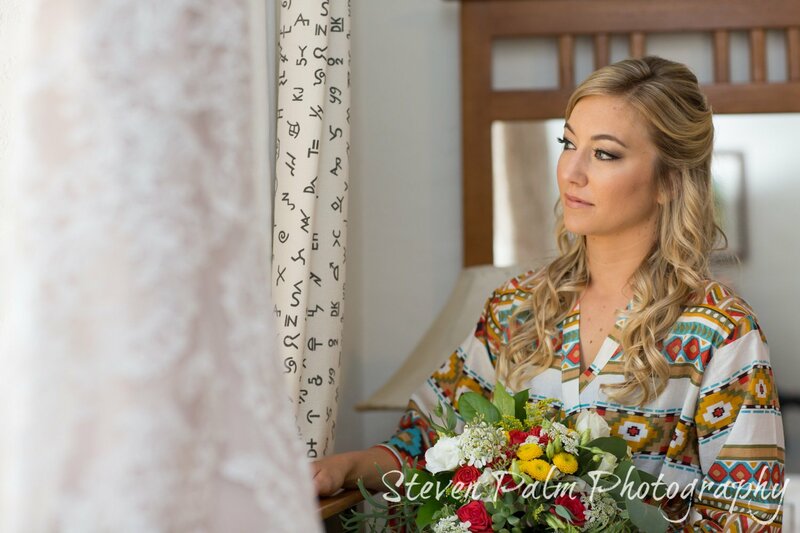 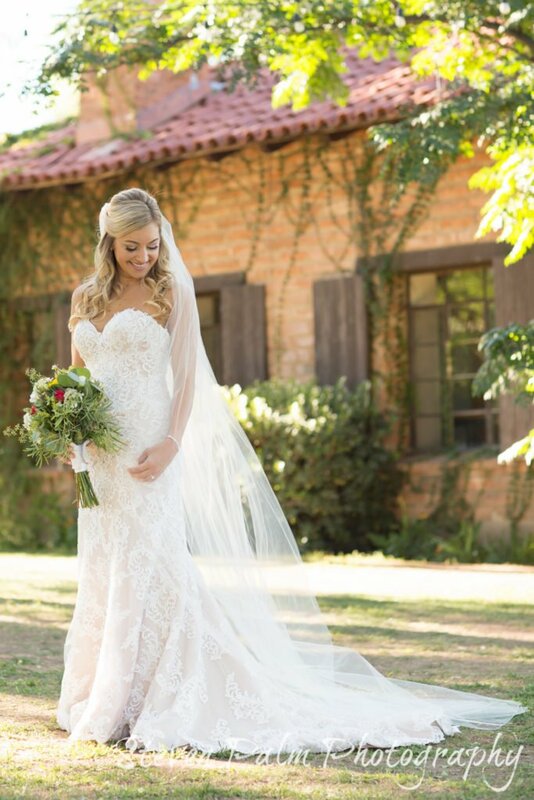 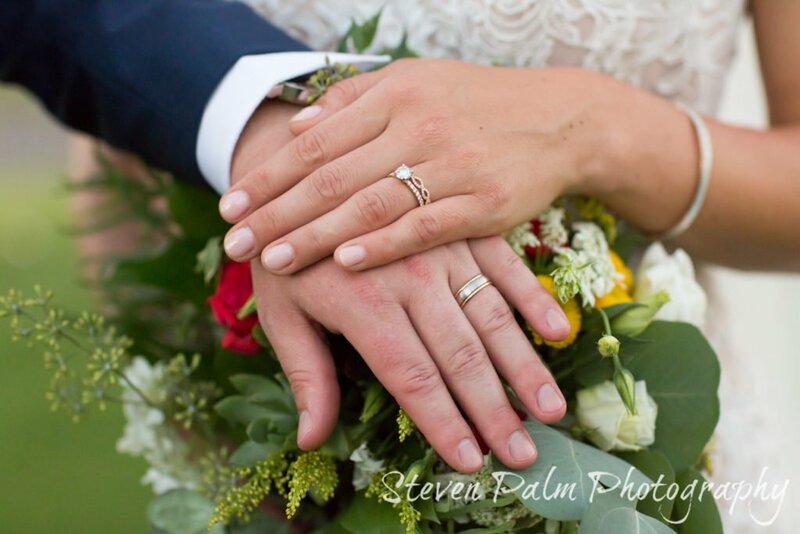 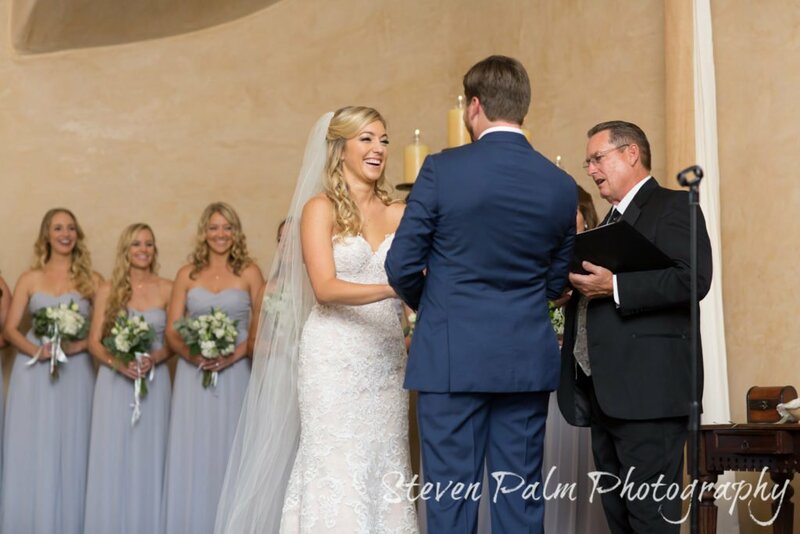 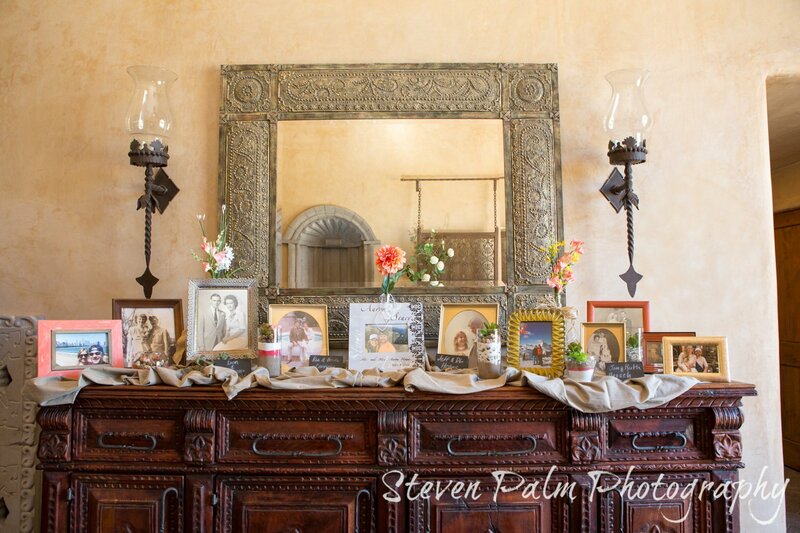 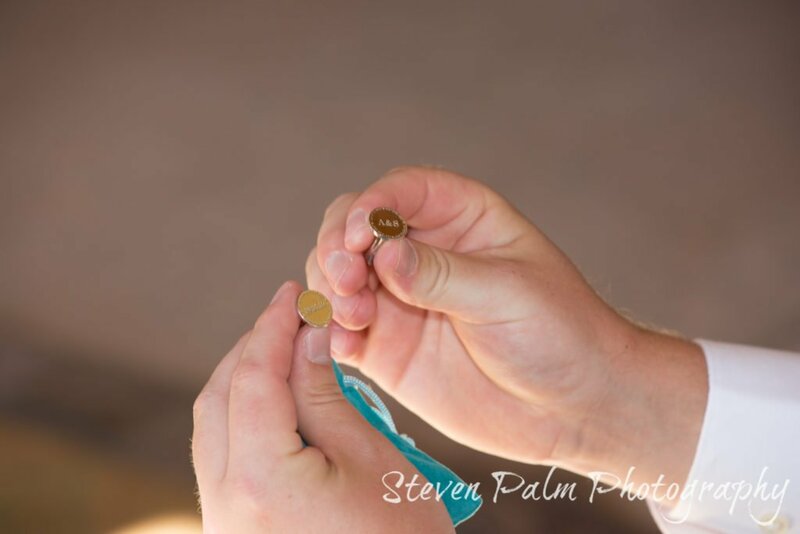 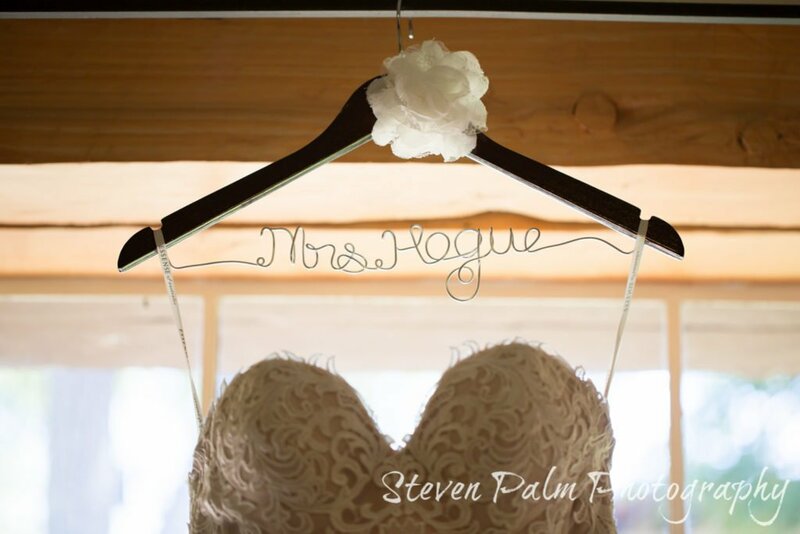 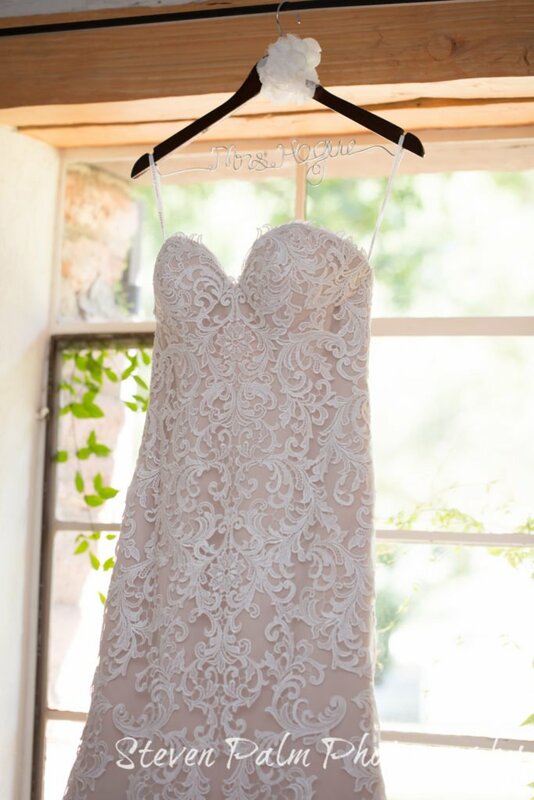 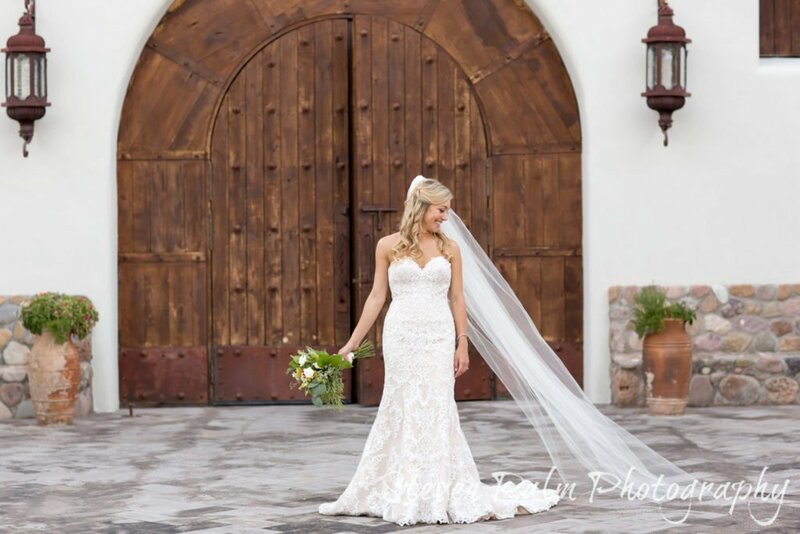 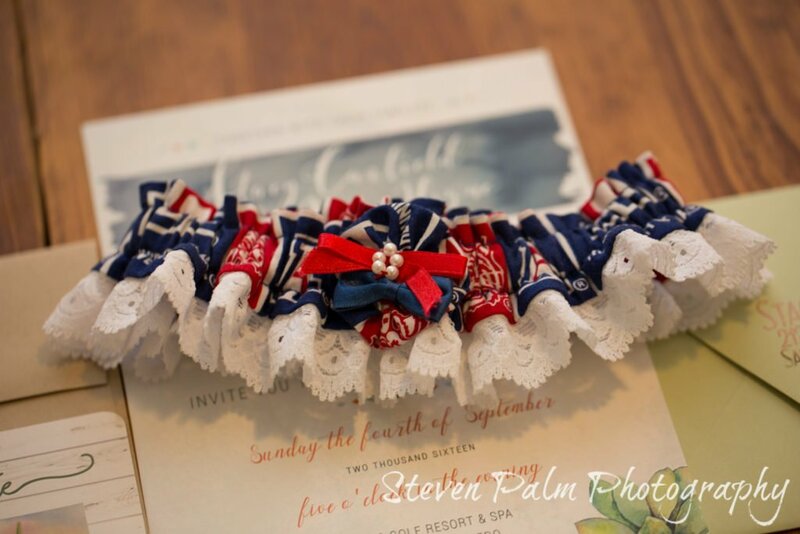 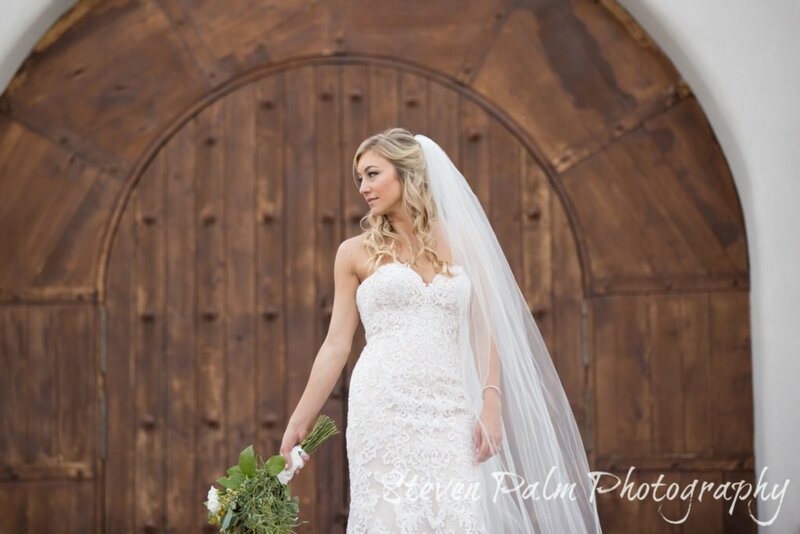 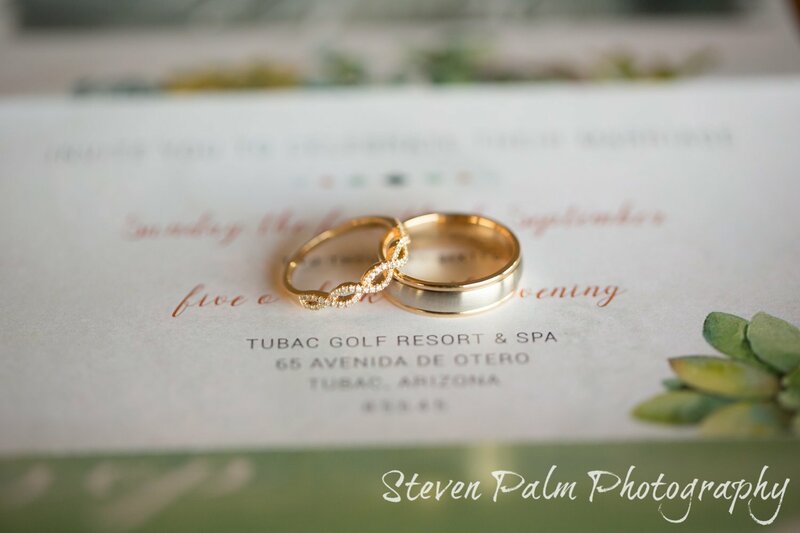 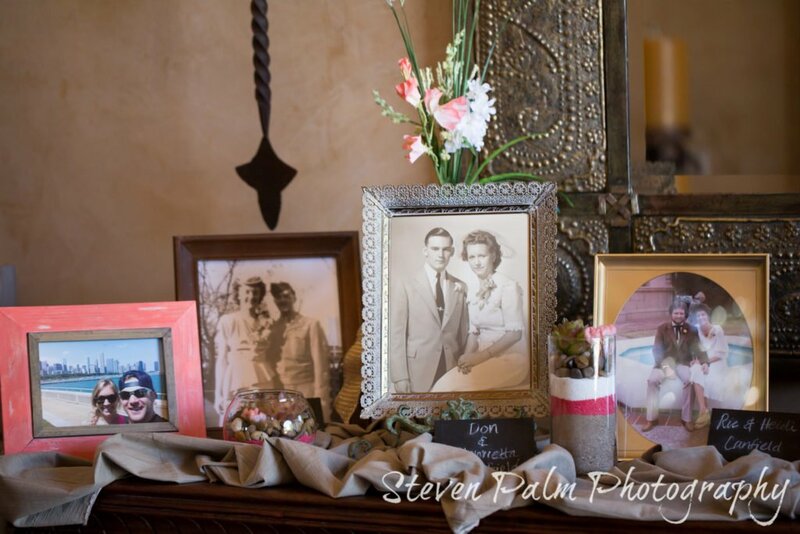 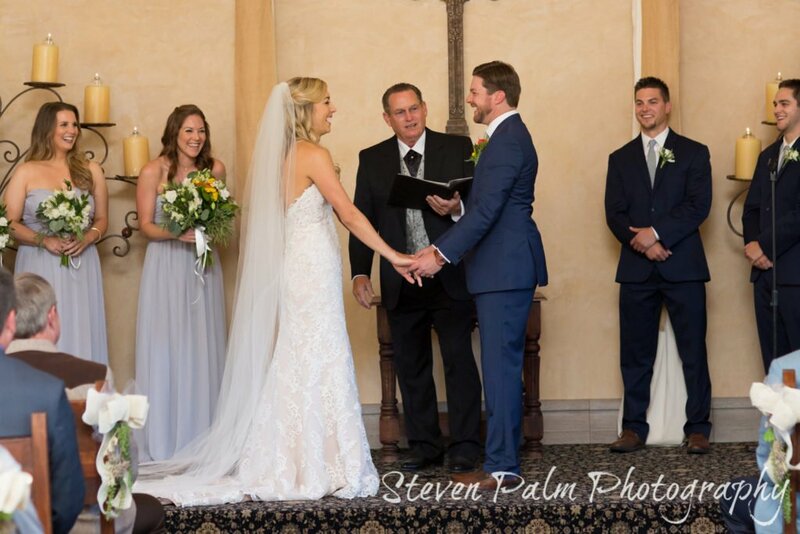 Charming Tubac Golf Resort and Spa was the ideal location for Stacy and Aaron’s resort wedding. 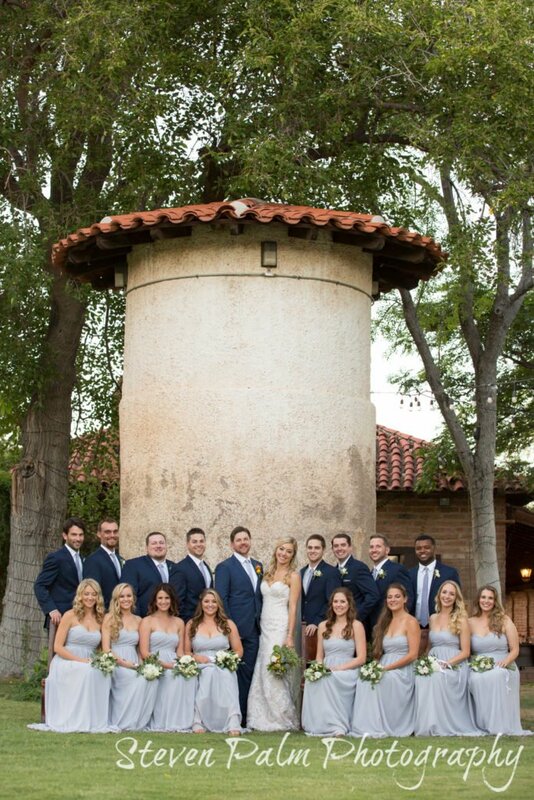 They met senior year at University of Arizona. 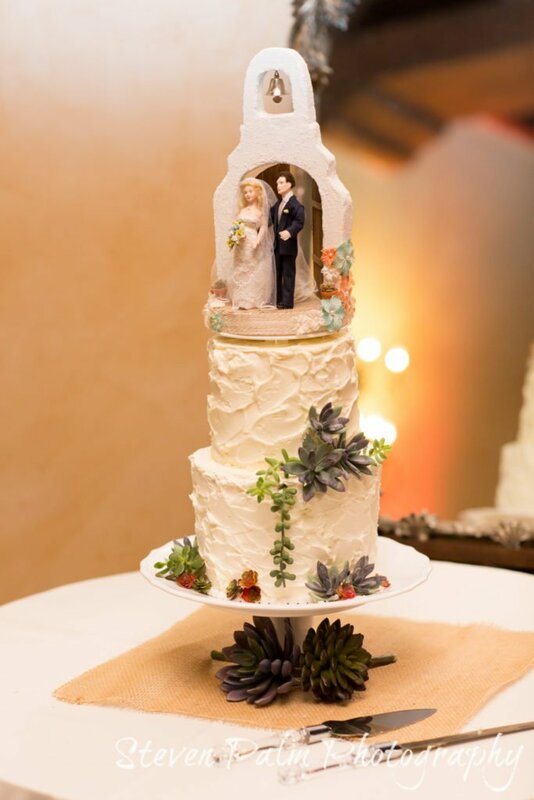 Therefore, the desert definitely has a special place in their hearts. 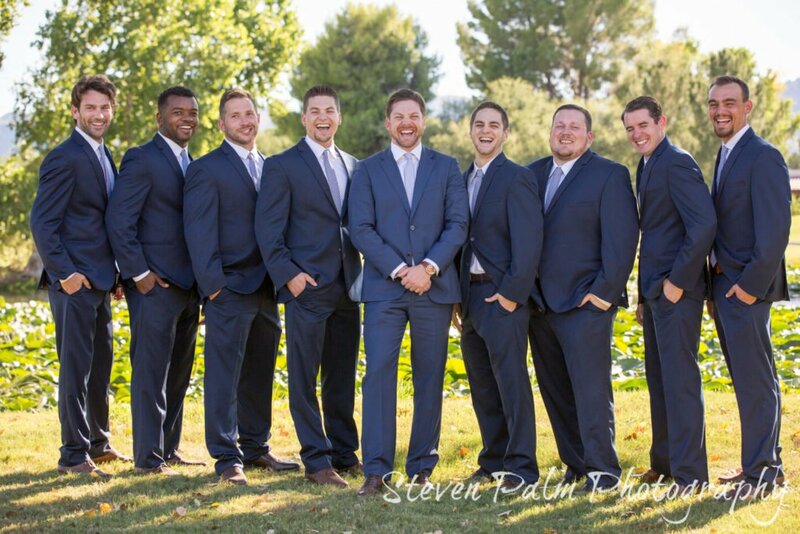 However, their career paths have brought them to settle in San Francisco. 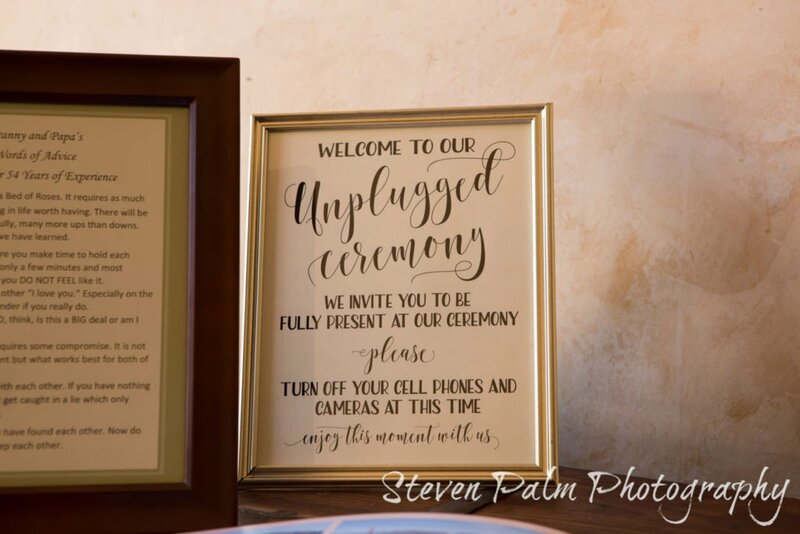 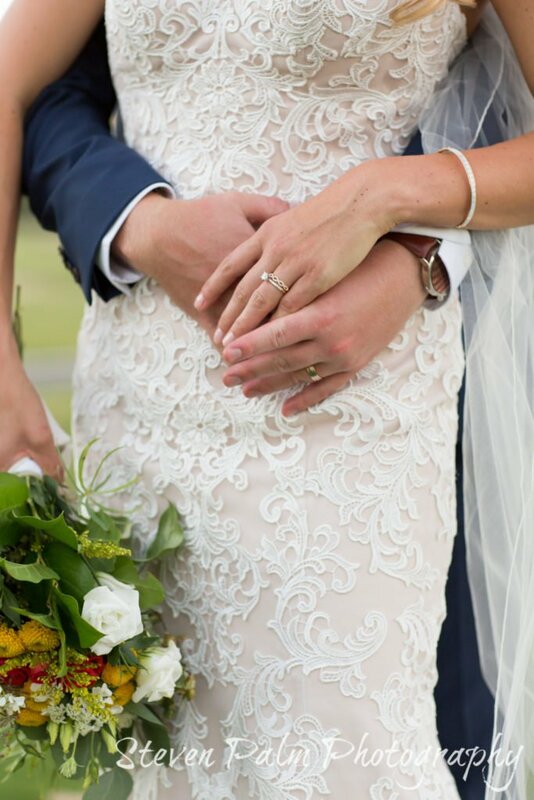 Planning a wedding from afar can be difficult, but with great family and friends, along with a fantastic vendor team, their day went off without a hitch. 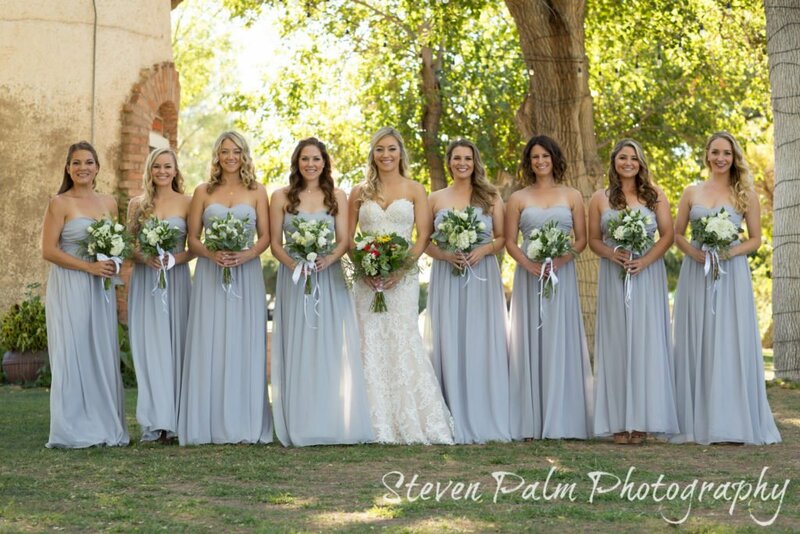 Their bridal party of 18 were scattered all throughout the United States. 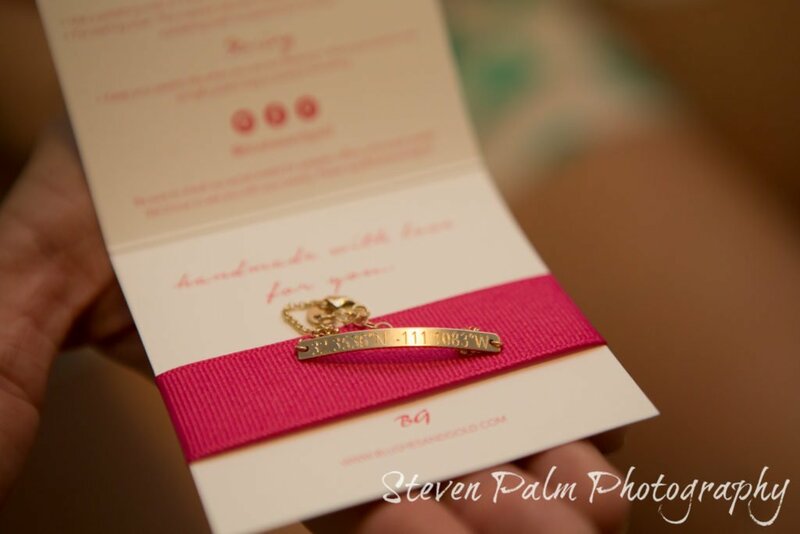 Fittingly, Stacy gifted her bridesmaids a gold custom coordinates bracelet representing where she met each lady along her journey. 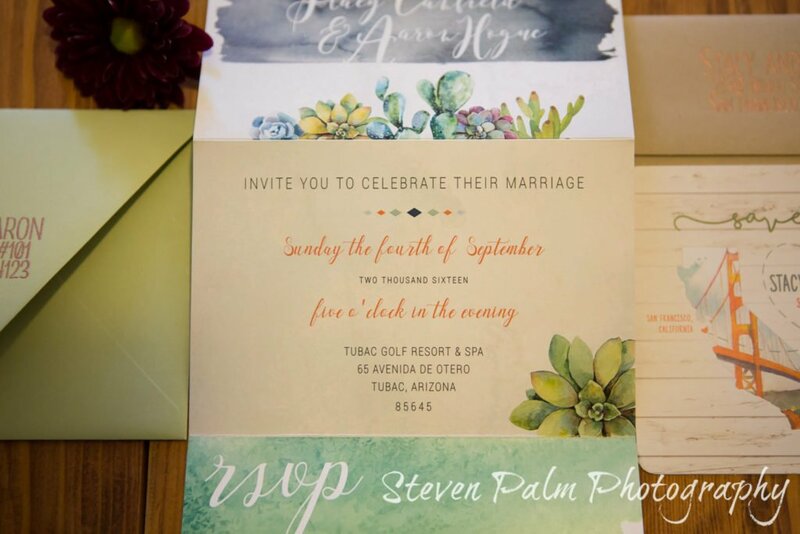 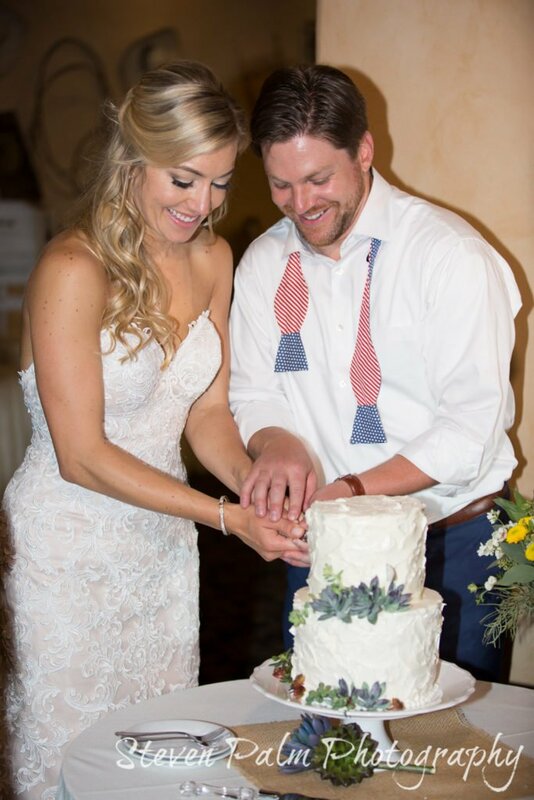 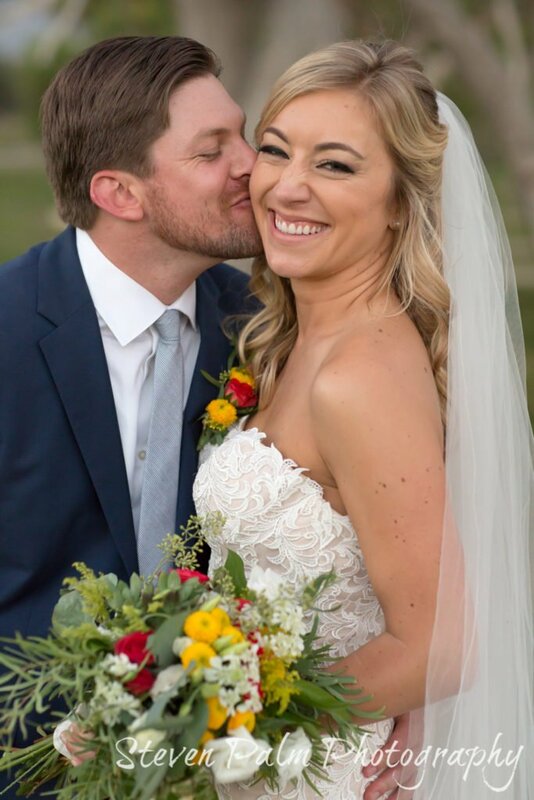 Incorporating desert elements into their wedding was definitely important to Tucson native, Stacy. 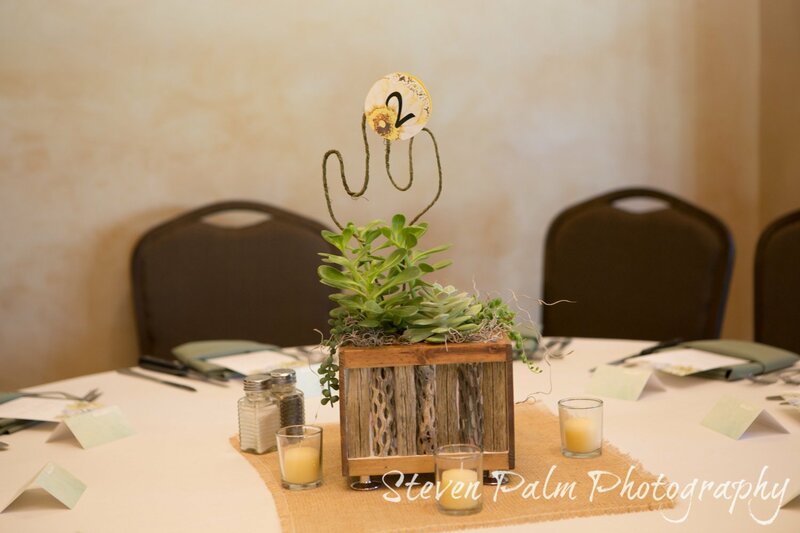 Knowing this, her dad built the centerpieces from cholla skeleton found in their backyard. 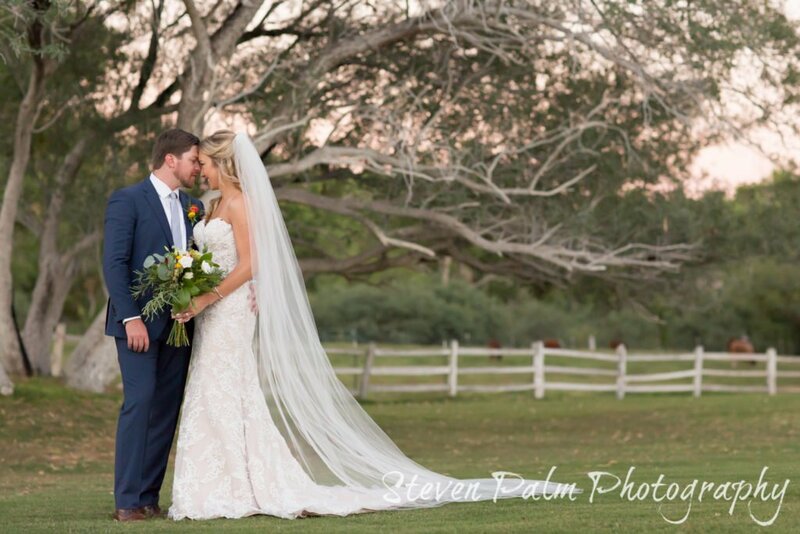 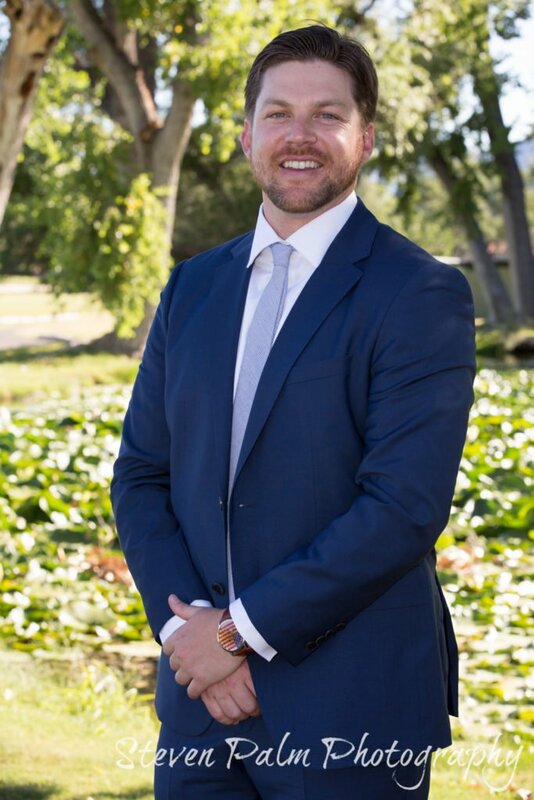 Also, Aaron’s extreme love for golf made Tubac Golf Resort the perfect weekend celebration spot. 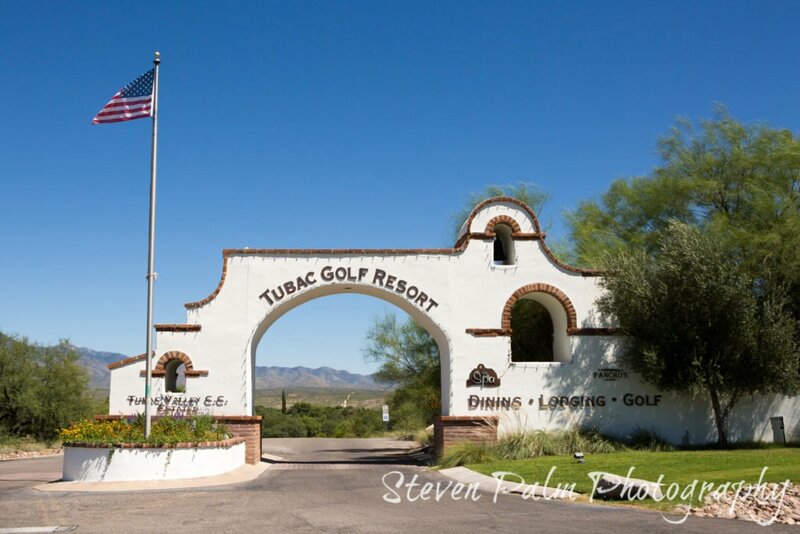 Tubac Golf Resort is widely know for its' championship golf course. 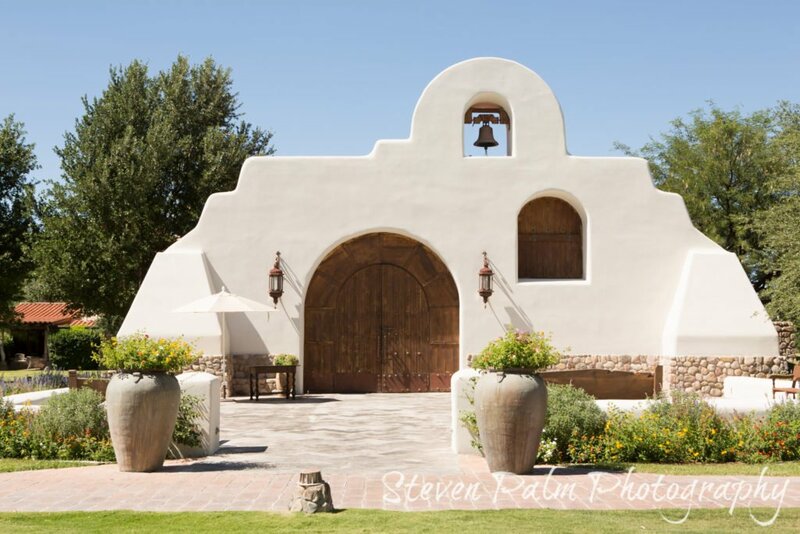 In addition, Tubac is also known for its' 1700 replica missionary chapel. 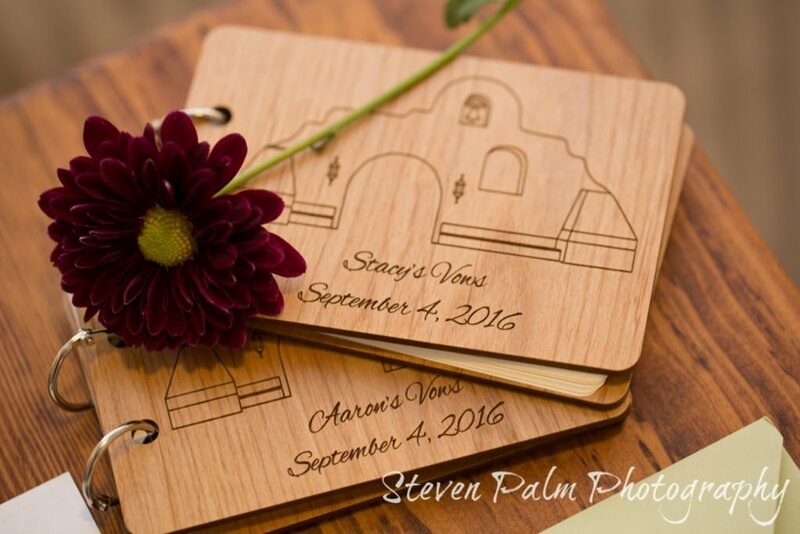 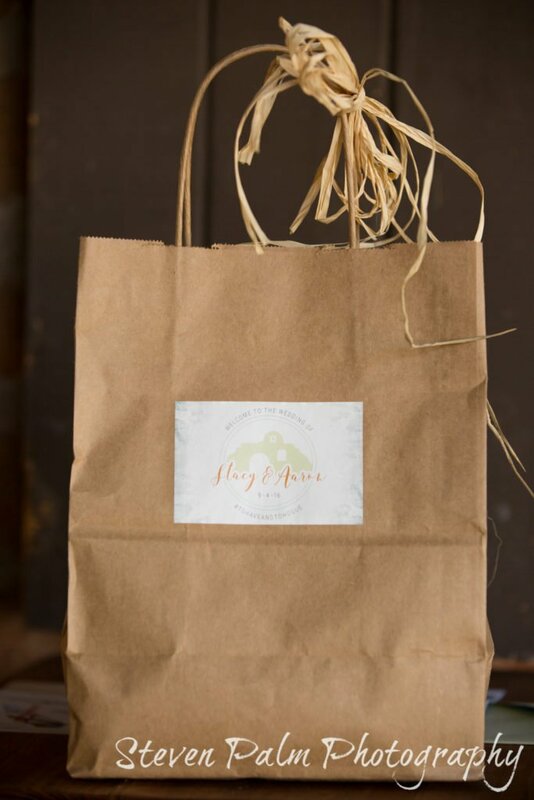 Stacy’s friend, Kelly, designed their very own wedding logo with the Tubac chapel as the background for stationary, invites, and dinner menus. 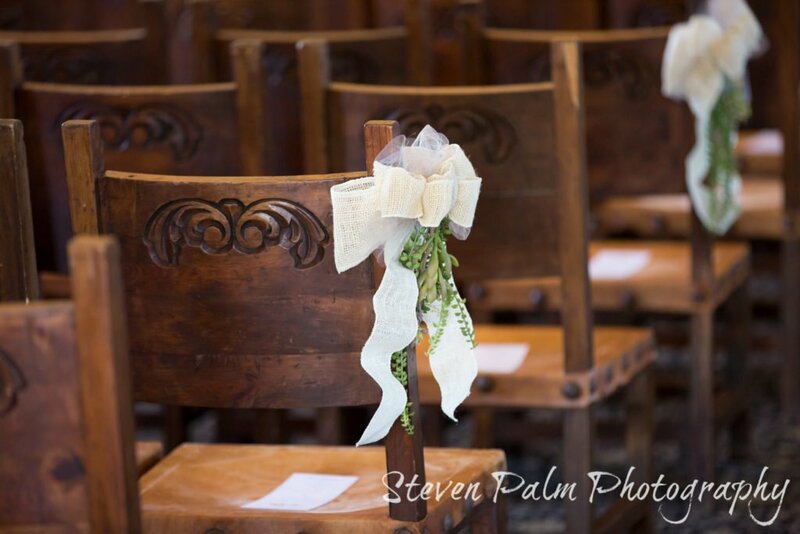 With their ceremony in the chapel, little décor is really needed. 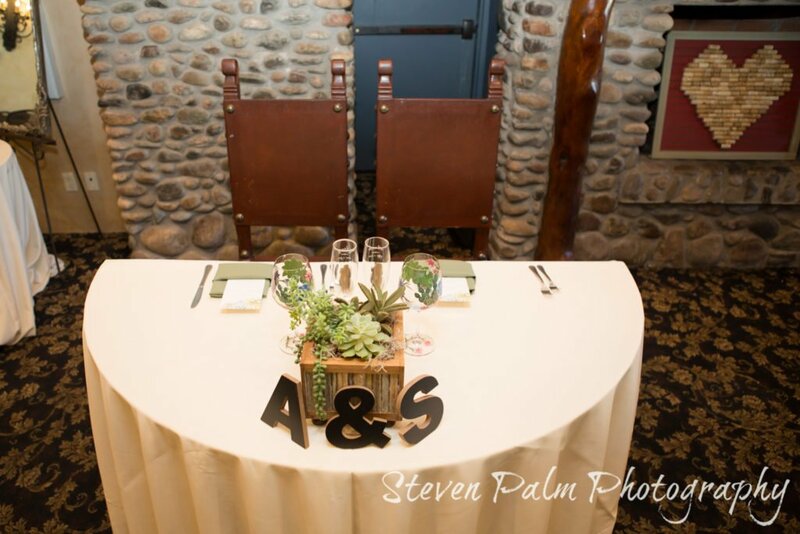 However, Aaron's grandmother added a burlap bow with succulents down the aisle that really enhanced the rustic charm. 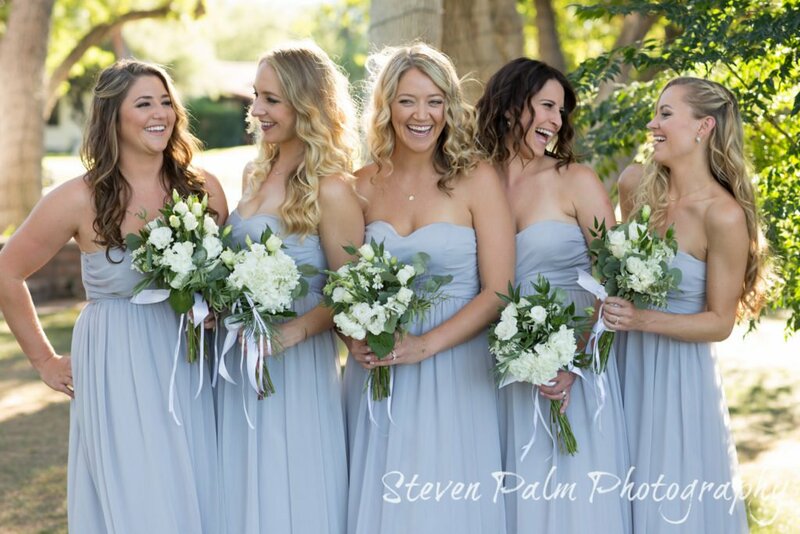 This lighthearted attitude was evident throughout their day. 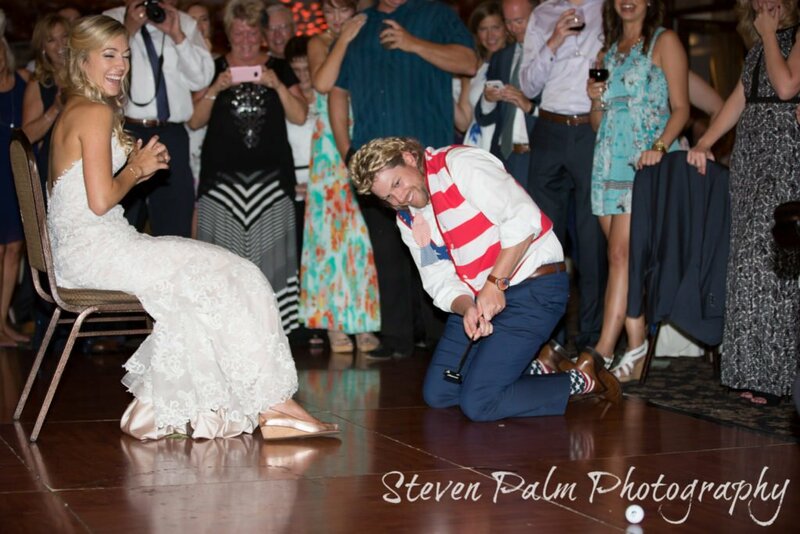 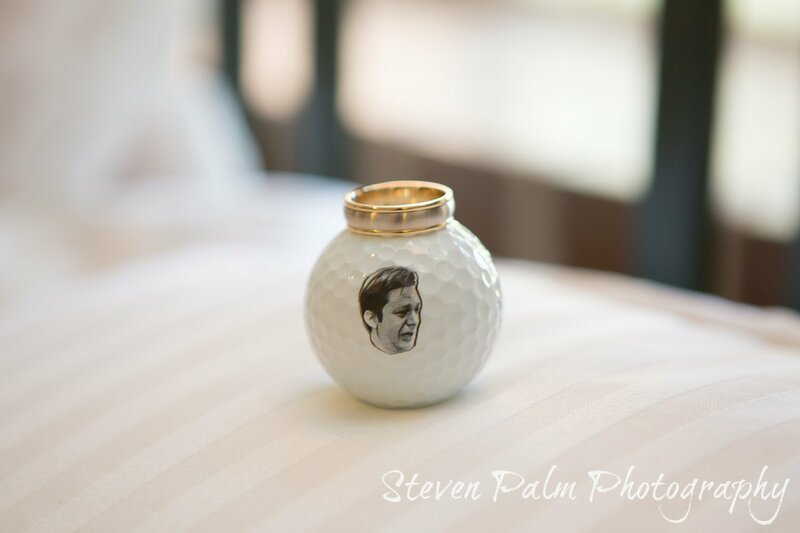 For instance, Stacy's personal vows to Aaron used every golf term in the book to describe their relationship. 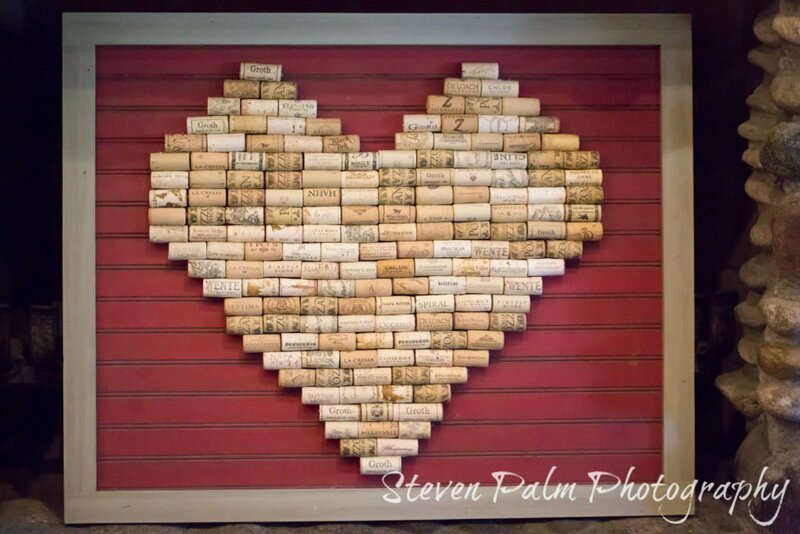 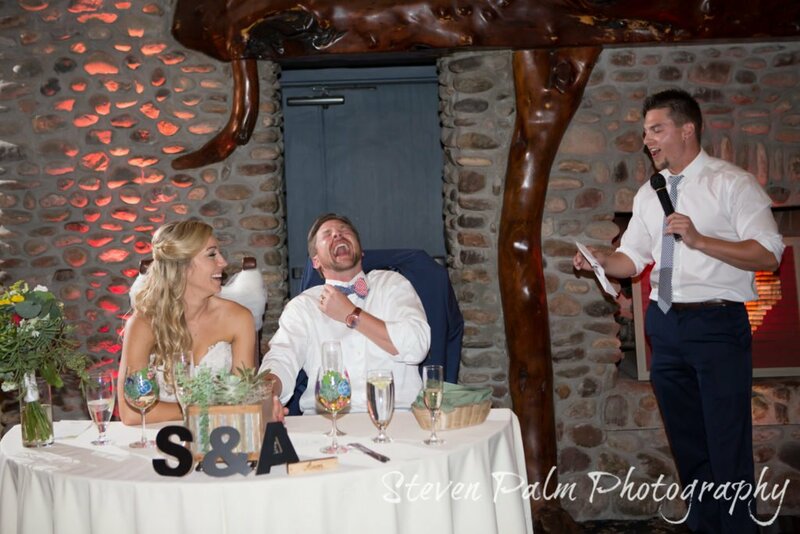 Heartfelt additions like this, had their guests (along with the bride & groom) erupting with laughter throughout the ceremony. 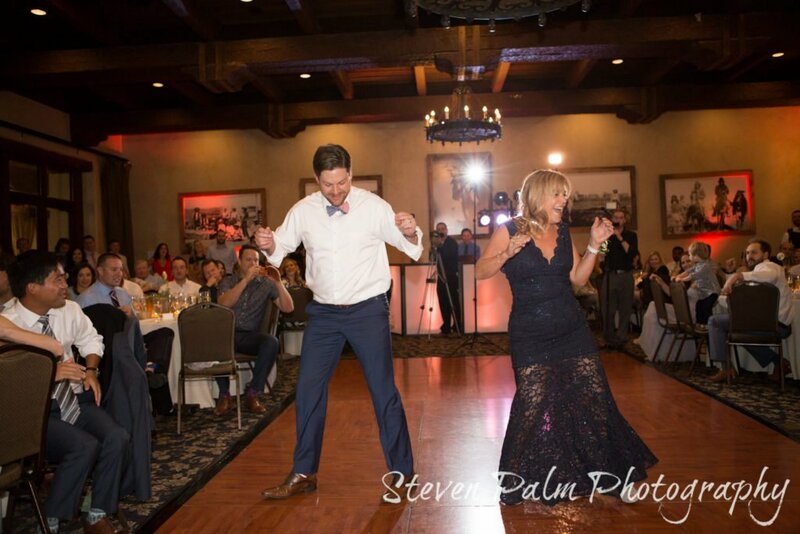 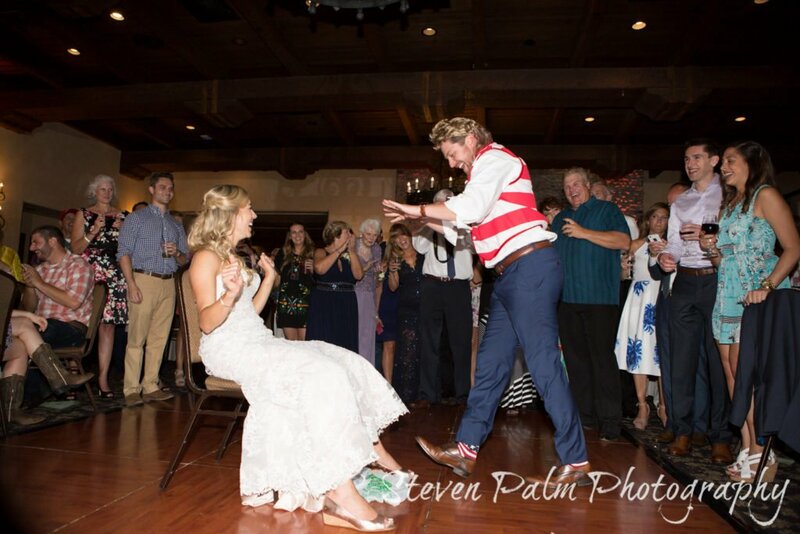 The entire night was filled with this same laughter and love for the couple from the dances to the toasts. 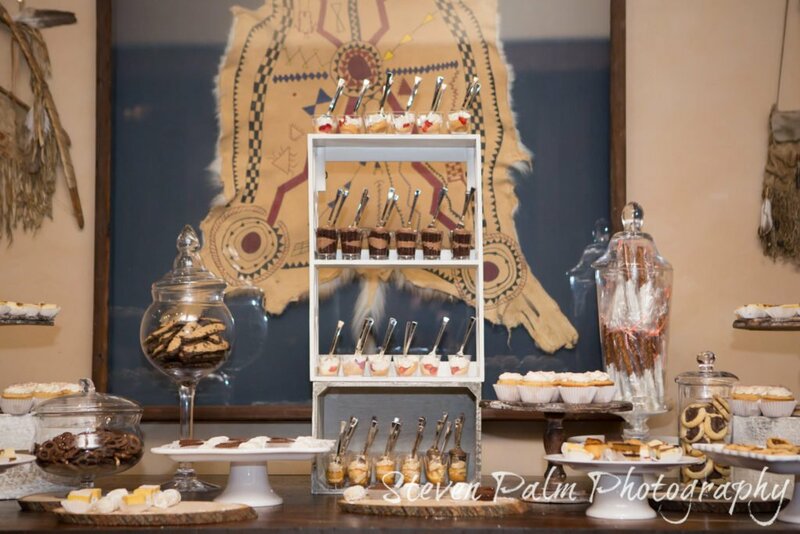 Lastly, the buttercream cake and dessert table by Sweet Creations did not disappoint, fulfilling every sweet tooth with éclairs, cookies, and cannoli’s. 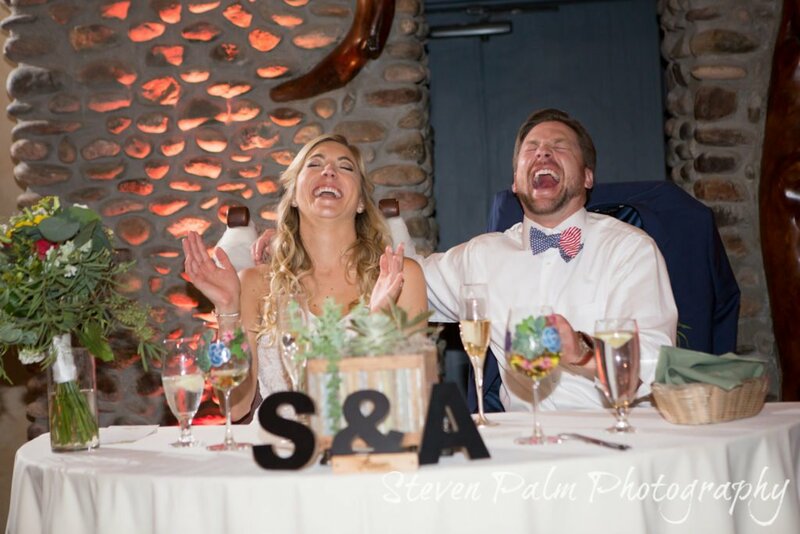 On your wedding day, and everyday, laugh and love. 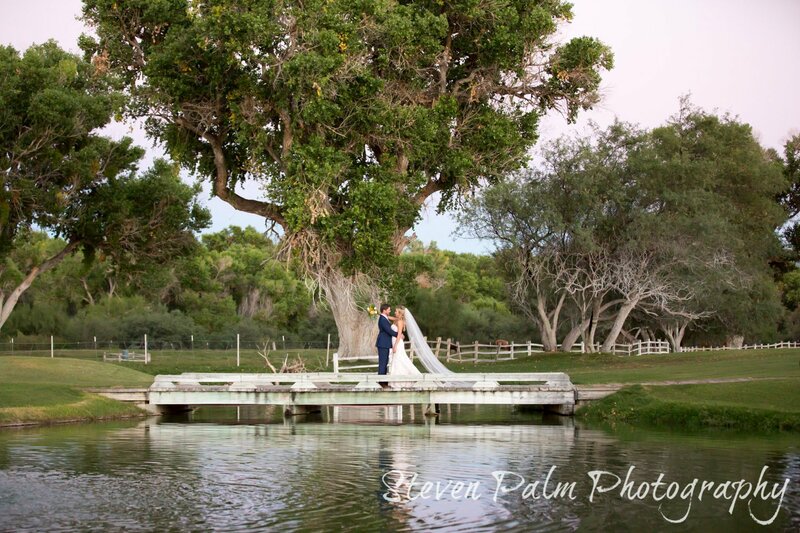 This couple sure had that mantra down! 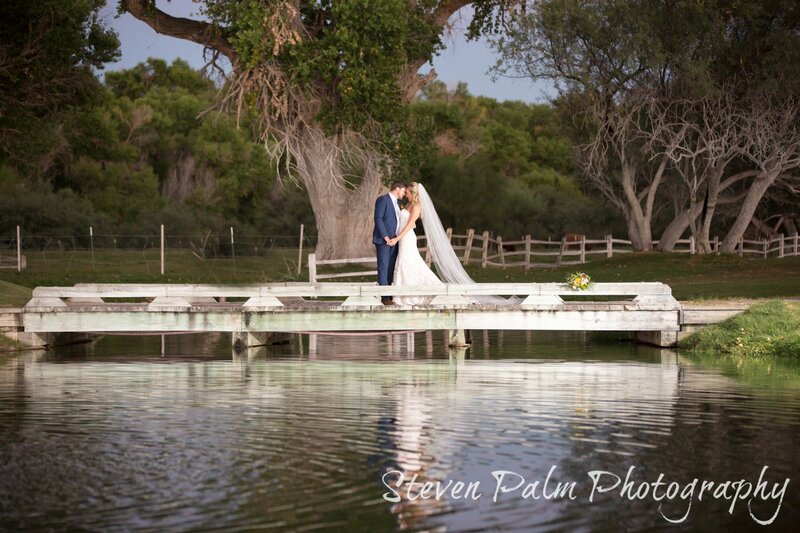 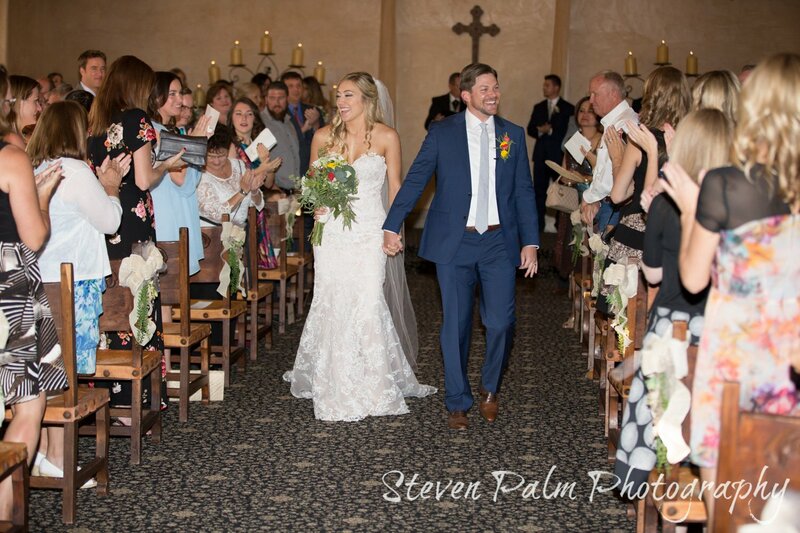 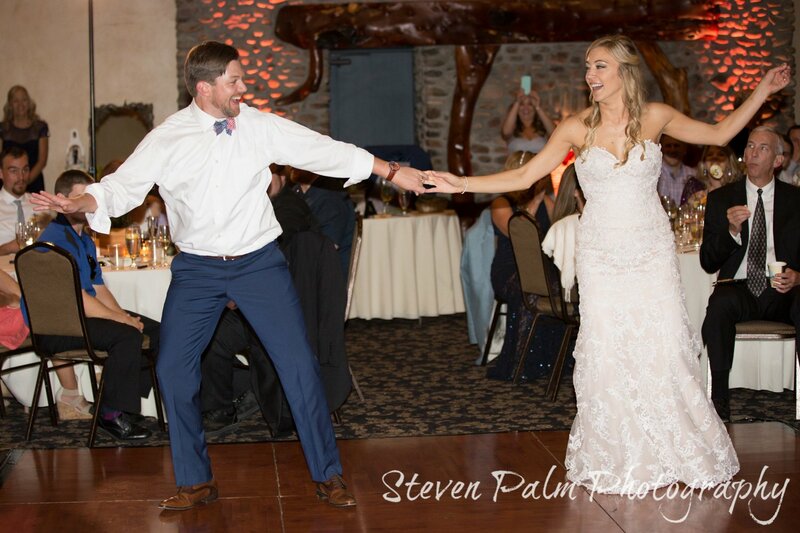 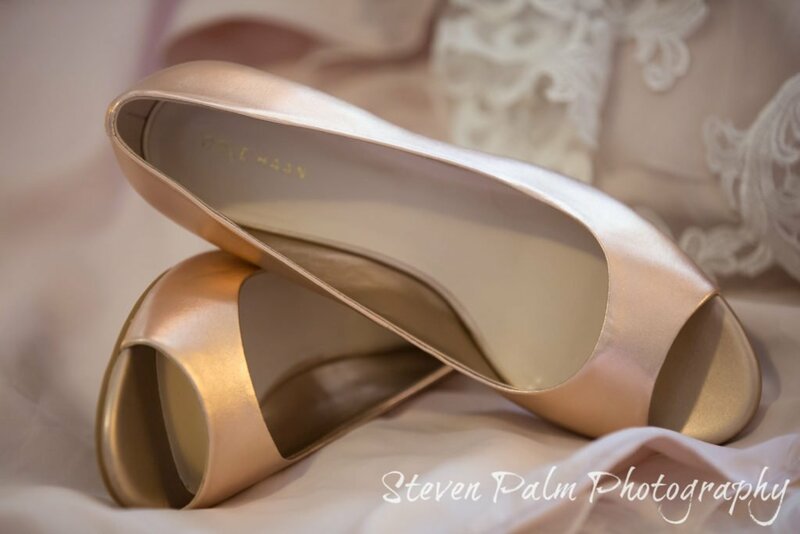 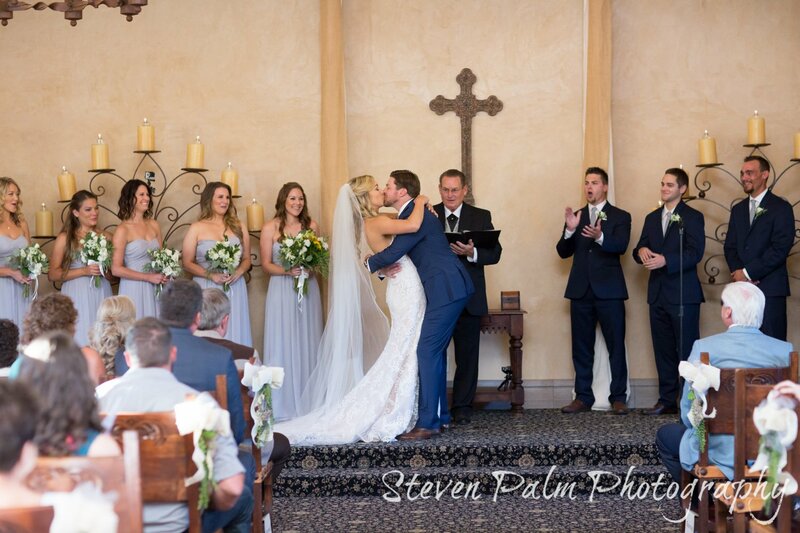 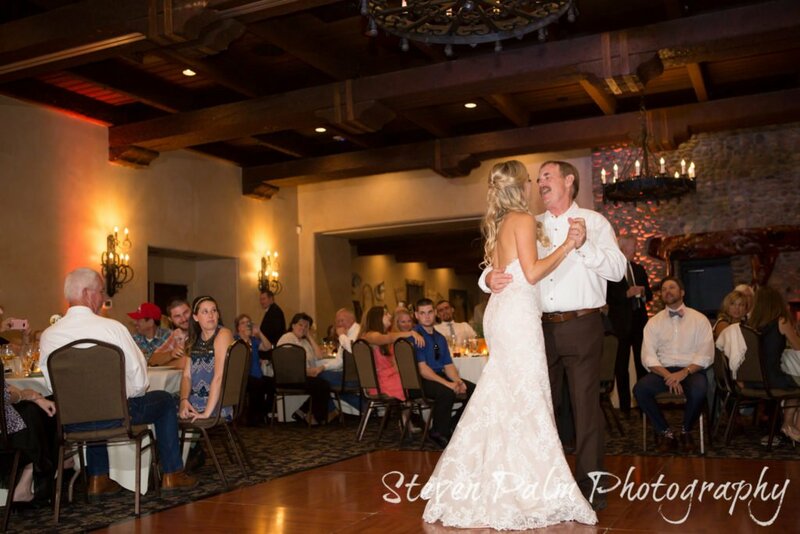 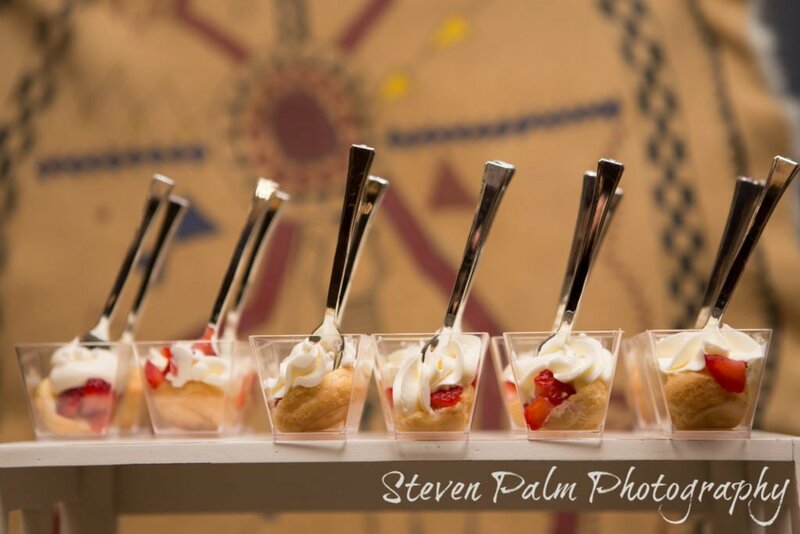 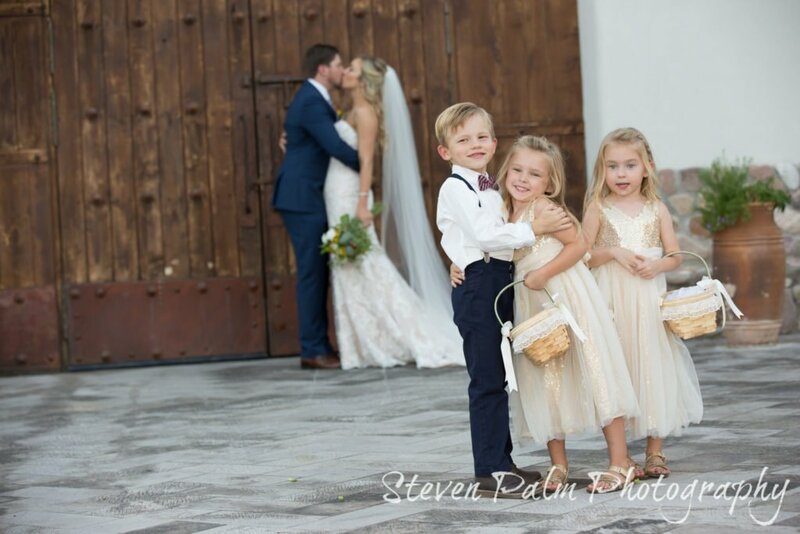 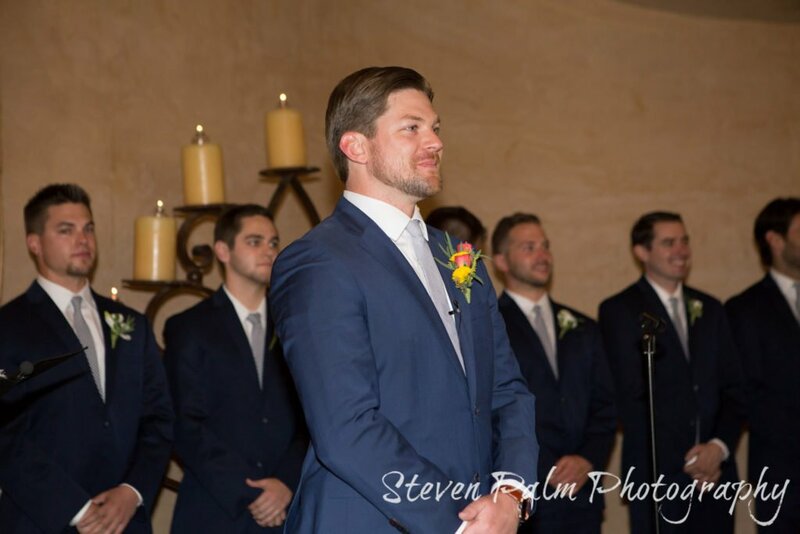 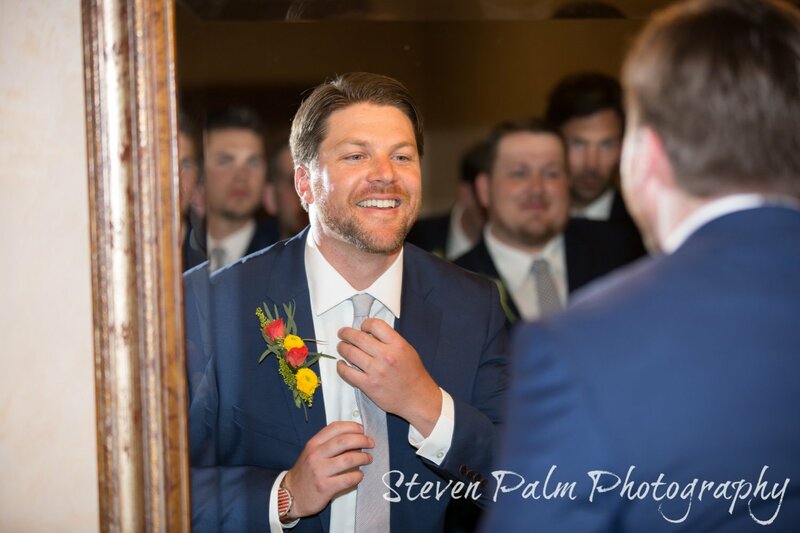 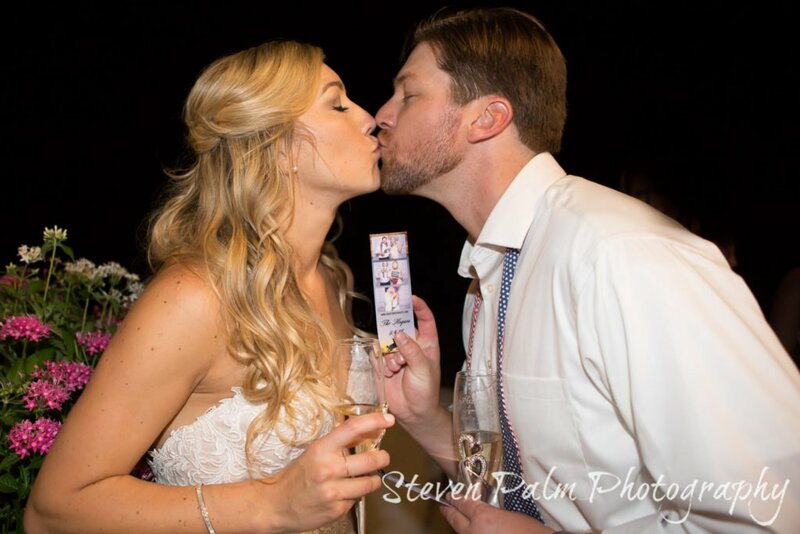 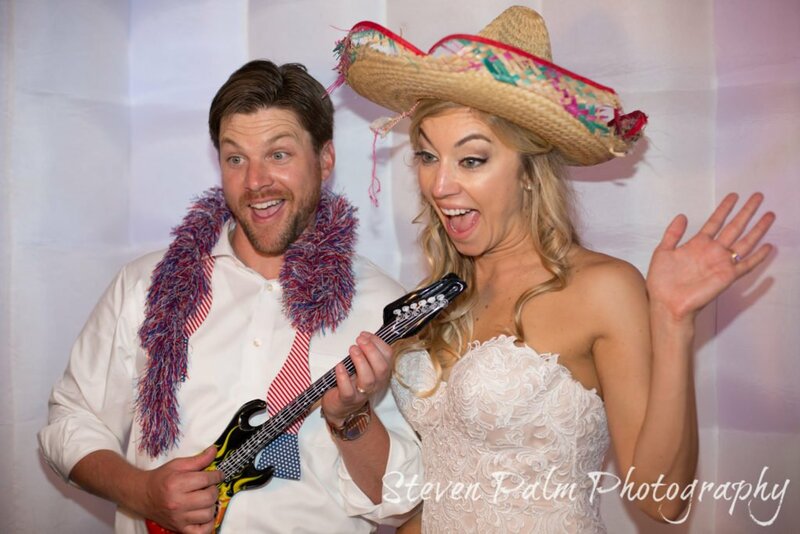 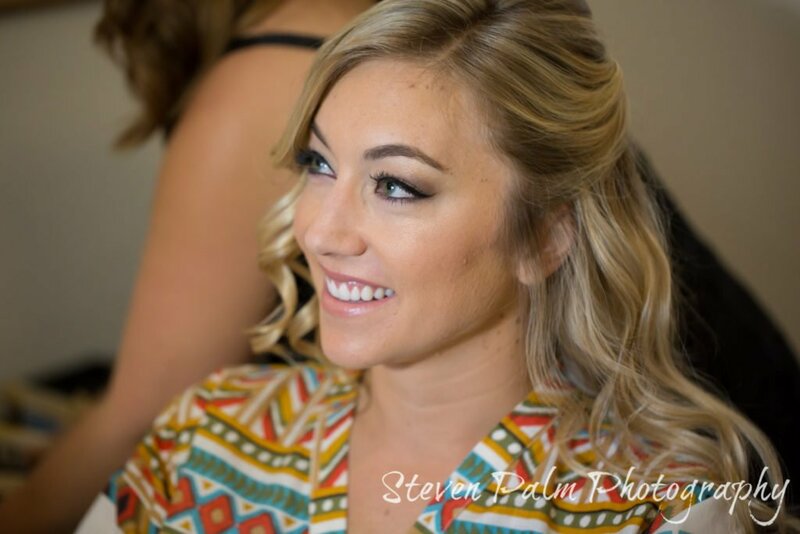 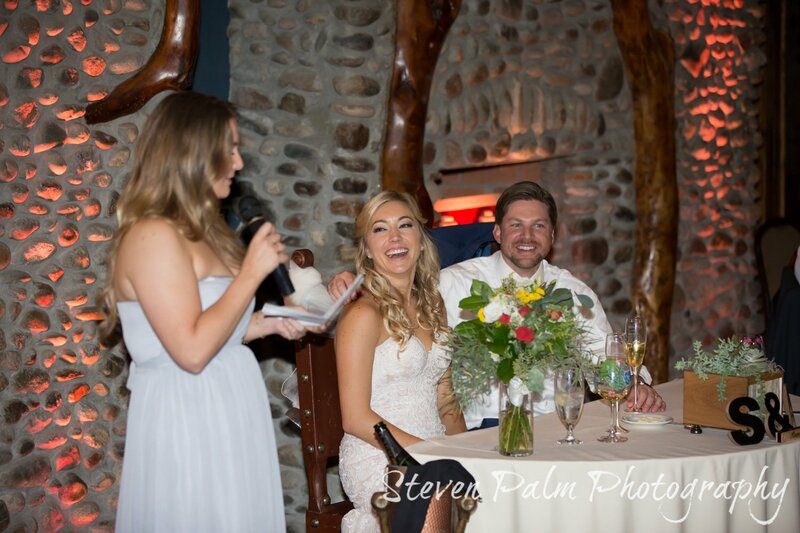 Thank you for choosing Steven & Alisha to capture your moments! 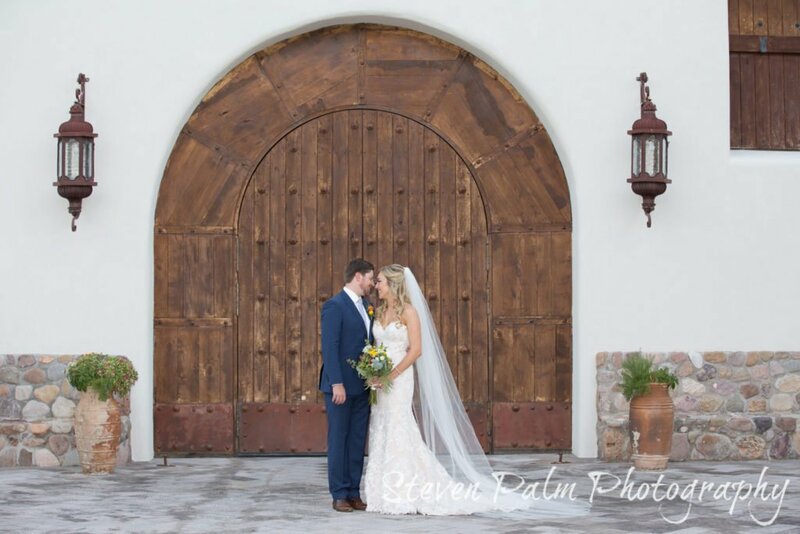 Steven and Alisha Palm of Steven Palm Photography are an award winning husband & wife wedding photography team based in Tucson. 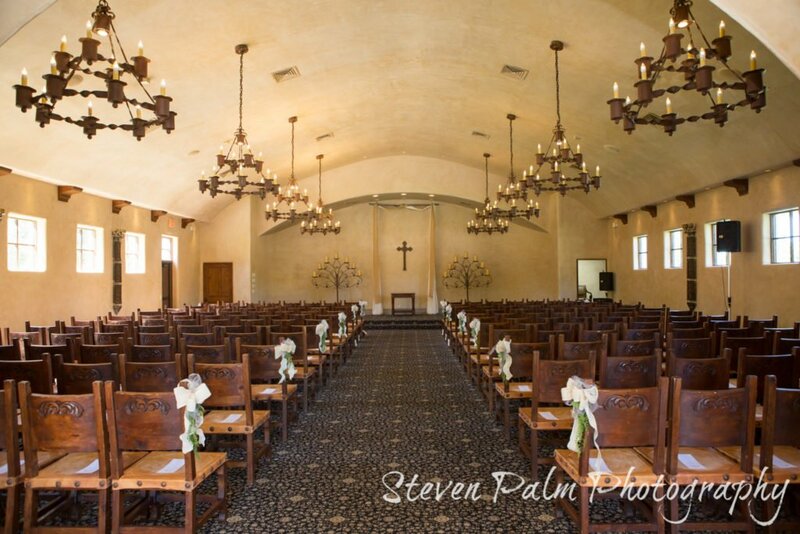 Looking for another lush venue in Tucson? 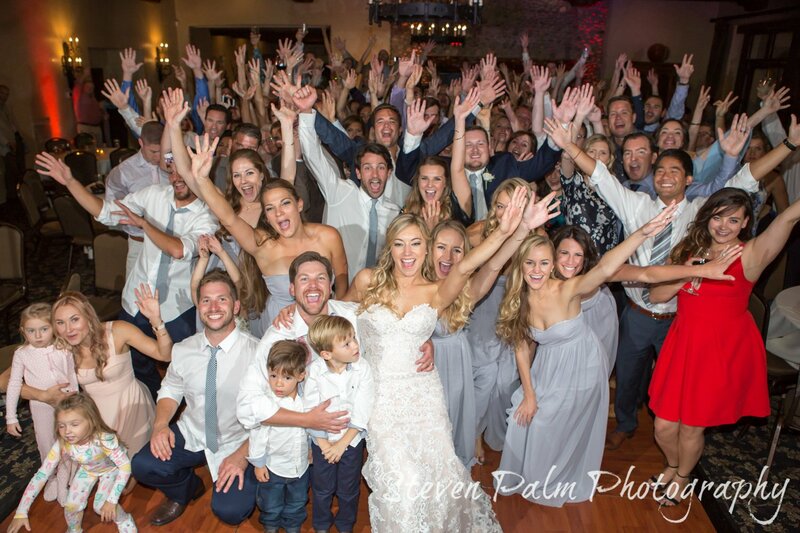 Check out this wedding.